It’s a busy week at the hotel! Wednesday is Spaghetti Western Night. Doors open at 5:30 and the movie starts at 6:00. Choose from the regular menu or the pasta special. Thursday is Martini Night. Join us for dinner and one of our special martinis. Friday Night is Comedy Nite. Comedian Dan Mires and is line-up will be performing in the saloon starting at 8:00pm. No cover charge! 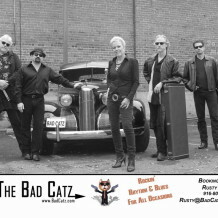 Sunday the Backyard Blues ‘n’ BBQ Series continues with Bad Catz performing. BBQ starts at noon, and music is from 1-4. Bring your suit and come hang out poolside!